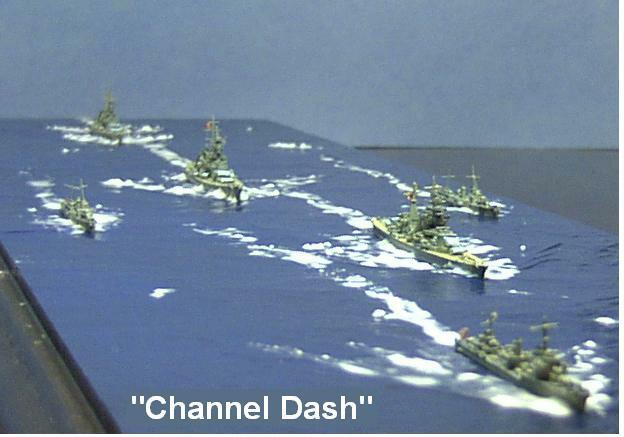 Presented here are scale 1:1200 (1”=100’), 1:1250 (1”=104’) & 1:2400 (1”=200’) miniature metal waterline models of the warships of the world’s navies of WWI, WWII and modern day. All are precision metal castings, finely and accurately detailed down to 20mm & 40mm mounts, deck hatching, cranes, catapults, etc. Turrets of six inch guns and larger swivel on the decks and thus can be trained for wargaming purposes. So if you have an interest in the sea and the operational and design histories of the great ships and their weaponry of the 20th & 21st centuries, then you’ll want to get started on your fleet right away whether your objective is collecting or being a wargame admiral. Read on for more information. Q: What do 1:1200, 1:1250, 1:2400 scales mean? A. 1:1200 is the “Recognition” scale of 1” = 100’ that was used by the USN in WWII for pilot and lookout recognition training. This means that for an actual ship 800” long, the model of it will be 8” long. Models made in Europe use the metric scale which is 1:1250 or 1” = 104’. We also carry 1:2400 models which are 1” = 200’ scale. The above model would be 4” long in this scale. Q: What does “Waterline” mean? A. It means that the model sits on a flat surface and looks as the real ship would look sitting in the water. Q: Of what metal are these models made? Q: About how many parts do these kits have? A. Unlike plastic kits, the hull and superstructure are mostly one-piece castings. Turrets, catapults, cranes and masts (in some ships) come separately for capital ships. “Crazy” glue is fine for cementing parts to the hull. Note that assembly directions are not included as it is generally obvious where parts go. For further info, check photos on our website or Google the particular ship on which you are working. Pictured above is how a GHQ 1:2400 kit comes to you. The model is shown in approximate actual size. The Superior and other 1:1200 kits are similar except the parts come in a bag and not on sprues. Q: If I decide to go with kits, what tools will I need? A. 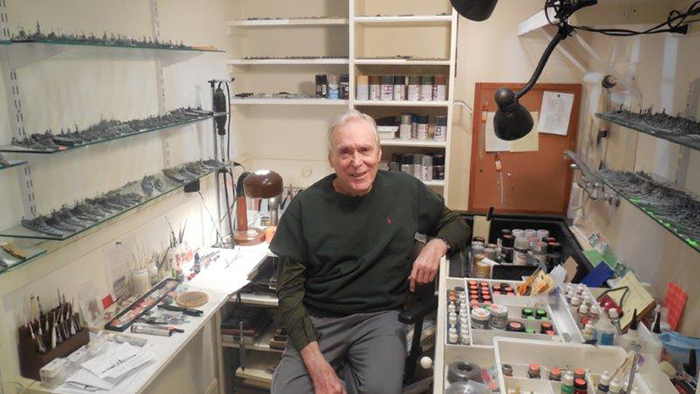 There is a whole section on our website dealing with model finishing. Basically, you’ll need a needle file and an X-acto-type knife to remove “flash” and minor burring from the castings and a drill (Hand or better yet, a Dremel tool) to bore holes where indicated for turret stalks. Q: What if I damage a hull or part in assembly? A.	Here’s where the Alnavco guarantee kicks in. If you damage a hull and can’t repair it, return the hull and we will replace it free of charge. If you damage a part, just let us know what it is and we will send it to you again, free of charge. Q: Where can I go for paints and painting information? Q: I note the Navis (WWI) & Neptun (WWII) 1:1250 models come completely assembled and painted and that many come in different “Rigs”. I see different letters after the code numbers on some models. What do they stand for? A. These are among the finest miniature models made and a huge selection is offered. T Series: Models that are painted in a camouflaged rig that a particular ship had at some point in its history. P Series: U.S. vessels in the paint schemes they had at Pearl Harbor, 7 December 1941 X Series: U.S. ships painted in “Measure 21”, a blue based camouflage scheme which was used in the western and southern Pacific mid-1942 to 1945. This was done to make the ships less detectable and harder to identify from the air. 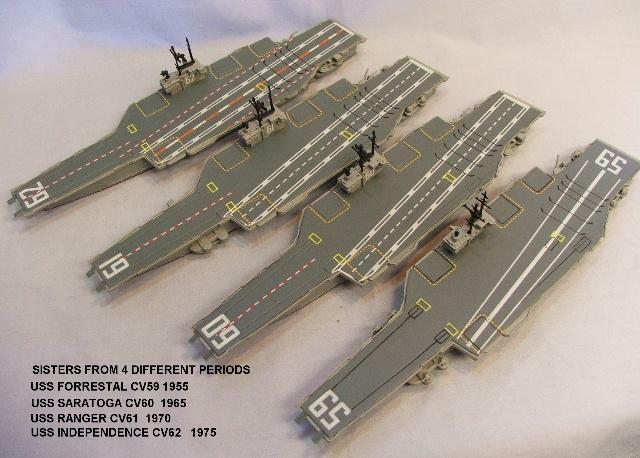 Q: My miniature carriers will need aircraft. Are any available? A. There sure are! Go to our website and click “Aircraft” and you will be able to fill your CV decks with the same scale aircraft that actually flew from the real ships. Floatplanes for your battleships and cruisers too! Cap Aero offers a huge selection as does Clydeside including carrier aircraft with folded wings. Also check out Neptun’s collection of aircraft and Airship models (Akron, Macon, Hindenburg, etc.). Q: Where can I find information on individual ships? A.	It’s probably obvious but the internet is the best. Wikipedia is an outstanding source. Q: Where can I go for magazines on naval history and other naval subjects? A. Three very good ones are Sea Classics, Naval History, & Proceedings of the Naval Institute. Go to our ship listings, determine what you would like to order and either call us toll free (1-800-446-4422) or email it to us. Unfortunately, we are not offering online ordering at this time. But feel free to use our search feature to find ships in which you are interested. When a code number is underlined, that means there is a photo of the model available. To see that photo, just click the code number. If there is a particular ship in which you are interested, go to our search engine by clicking “Search” on the title pages. The word “Buy” by an item does not necessarily mean that it is in stock. It means that the item it is in production by the manufacturer. You may also order and check stock by phone by using our toll-free number which 1-800-446-4422. Our manufacturers are small companies which produce many ships, thus they simply cannot keep us in stock of all models all the time. If any item(s) is not in stock, it is automatically backordered for you. Many of our customers carry “Wish Lists” with us of backordered items. This fastest way to get models you want that are not in stock. Backorders always take precedent when shipments are received. We are always glad to check stock for you via email or phone. Visit “Historical & Modeling Notes”. Here you will find articles on finishing and painting metal kits, converting one ship to another, naval wargaming, histories, pictures , warship stats , etc…and it’s all available to you compliments of Alnavco! 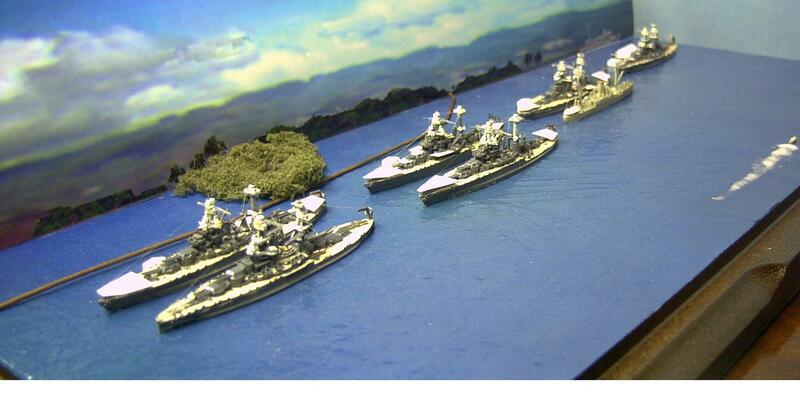 Interested in naval wargaming? These models are the ones used for waging battles in miniature. We carry GHQ’s "Micronauts, The Game" which is a comprehensive and realistic set of rules for any of the scales we carry. Click "Wargaming" on our site to see the details. "Never-weres" are models of ships that were planned by the world's navies but for one reason or another, never finished or started. Superior has a wide range of these ships and makes them available on a rotating basis. Note these are not "fantasy" designs but ones that were actually planned by the world’s naval architects. To find a list of them with very interesting historical background write-ups, click "Model & Historical Notes", then click "Superior Special Edition Ship Histories." Become a member of our Facebook page, Here you will find discussions on naval history and modeling subjects by our customers, photos of models finished by our customers, new model releases specials, etc. Membership is of course, free. Scroll down to see some dioramas and other displays. Also visit our "Photo Gallery" on our site to see pictures of collections, wargames, etc. The pictures shown on the opening pages of our website and those below do not necessarily show the models in actual size and are not necessarily in scale to each other. Interested in naval wargaming? These models are the ones used for waging battles in miniature. We carry GHQ's "Micronauts, The Game" which is a comprehensive and realistic set of rules for any of the scales we carry. Click "Wargaming" on our site to see the details. To see the model listings, click “Warship Models” on the left hand side of the this page. Have a question? Email us at alnavco@esva.net or call our toll-free number 1-800-446-4422. The CLEVELAND class of U.S. WWII light cruisers was the largest class of CL’s ever built. The original design had a round bridge which was incorporated into hull numbers CL55-63 (Superior model A403). Starting with VINCENNES (CL-64), this class was fitted with a square bridge (Superior model A404). 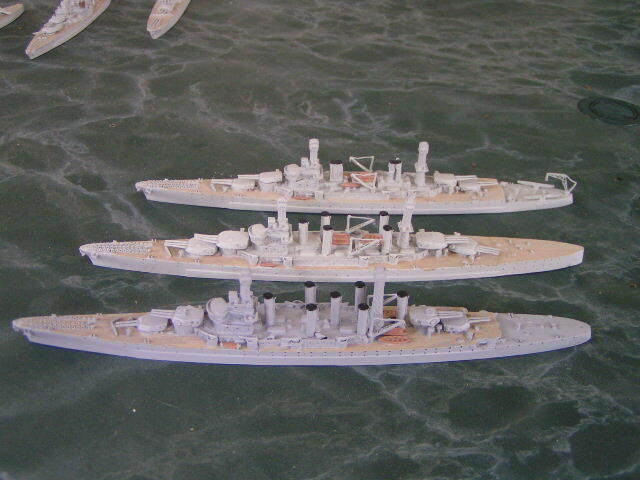 Modeler Henry Snyder has taken a group of A404’s and painted them in various camouflage (Measures) schemes and they are pictured here along with the hull numbers of the ships that were in a specific scheme at a specific time. 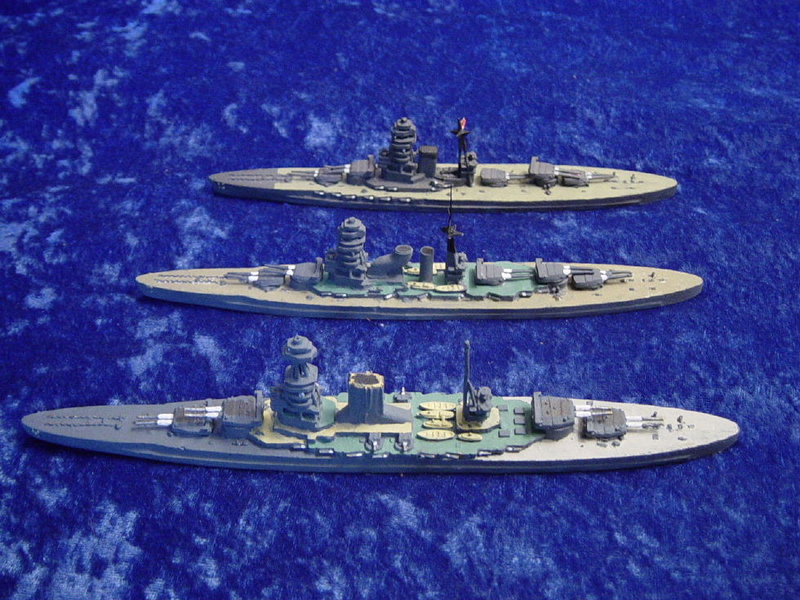 The LEXINGTON battlecruisers in 1:1200 scale by Superior; A204 “Project D” 1918, 7 funnel w/SOUTH DAKOTA guns; A203 Design of 1916, 5 funnel; A202 Design of 1921;These ships had a long conceptual stage but were put on “hold” because of WWI and then were cancelled by the Washington Treaty of 1922. The combination of high speed and powerful 16” guns would have served them well as it did the fast battleships of WWII. Models are 8 ¾ ” in length. 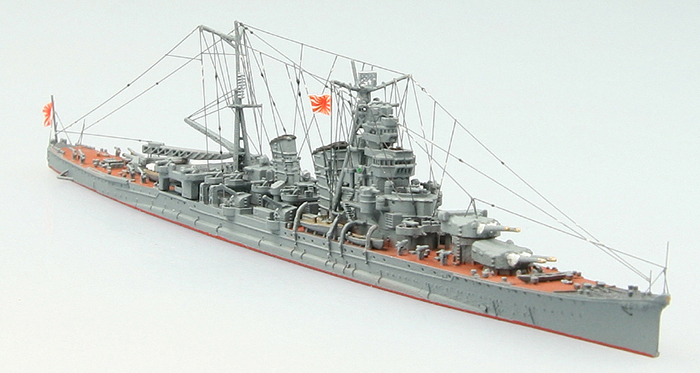 Neptun’s 1:1250 1234 AOBA, Japanese WWII heavy cruiser (5 ½”L); The modeler has repainted the basic model, & added radio antennae. 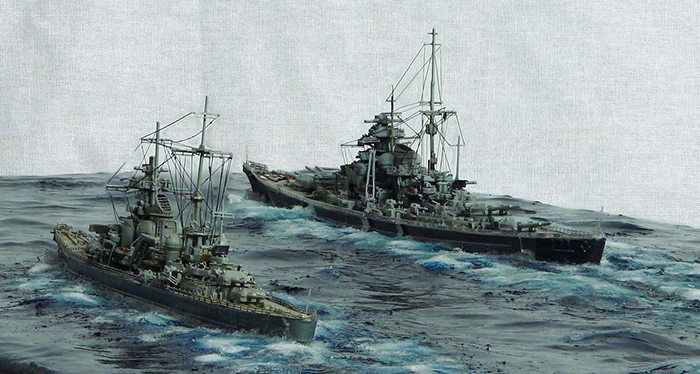 Neptun’s 1:1250 1030 PRINZ EUGEN (6 ¼ ”L), German heavy cruiser & BISMARCK (8”L), German battleship as they appeared in “Operation Rheinsburg” in 1941; Modeler Katseas Kostas has done a remarkable job custom painting them & adding radio antennae.